Behold, the happy mermaid. All photos by Emma Mutino. You know how we sometimes give away trips on Gentedimontagna? Well, people really do win them. Like Emma Mutino, winner of our Amalfi Coast giveaway last fall. Part of the prize was a trip planning consultation with a Gentedimontagna editor (in this case, Pavia Rosati), which sparked a long email correspondence about Emma's trip to Italy, her ancestral homeland. She had such a great time that we asked her to tell us all about it. AMALFI COAST – What is there to say that hasn't already been said about the rolling hills of Tuscany, the history of ancient Rome, and the surreal beauty and endless blues of the Mediterranean on the Amalfi Coast? Perhaps John Steinbeck said it best: "It is a dream place that isn't quite real when you are there and becomes beckoningly real after you have gone." For Italian-Americans, the beckoning is already deep within. No matter how many generations separate you from that one brave relative who made the decision to come to America to start anew, there remains a perpetual longing for and connection to Italy. For myself, this beckoning is very real. My father's family sailed through Ellis Island and settled in the greater New York metropolitan area during one of the first waves of Italian immigration in the late 1800s. Fast forward a few generations, and here I am, a 25-year-old Italian-American gal with a lust for travel, a love for Italy, and an incredible opportunity, thanks to Gentedimontagna's own Pavia Rosati. If it hasn't already been made abundantly clear by literature, film, and good old Instagram, let me reiterate: The Amalfi Coast is truly magical. Gentedimontagna let me experience this part of Italy in incredible way, when I won a trip giveaway they co-sponsored last November, a trip that would shuttle me between , a Relais & Chateaux hotel and restaurant sitting elegantly high in Sant' Agata sui due Golfi, almost touching the clouds, and , a family-run hotel and restaurant with rooms down at the sea in Marina del Cantone, with all the warmth of the sun and down-home comfort. This balance between high and low is an element of Italy that I am absolutely in love with. After waking up feeling like an absolute princess in Don Alfonso on a Tuesday morning, my boyfriend Vincent and I started our winding drive down to Marina Del Cantone. As soon as we started walking towards Lo Scoglio, I was smiling from ear to ear. I found Santina, matriarch of the incredible family behind Lo Scoglio, and was instantly greeted so warmly. And before I knew it, we were chatting with Giuseppe Masticiello of and boarding one of his boats. Our sailor, Salvatore, took us out on the most beautiful boat ride. 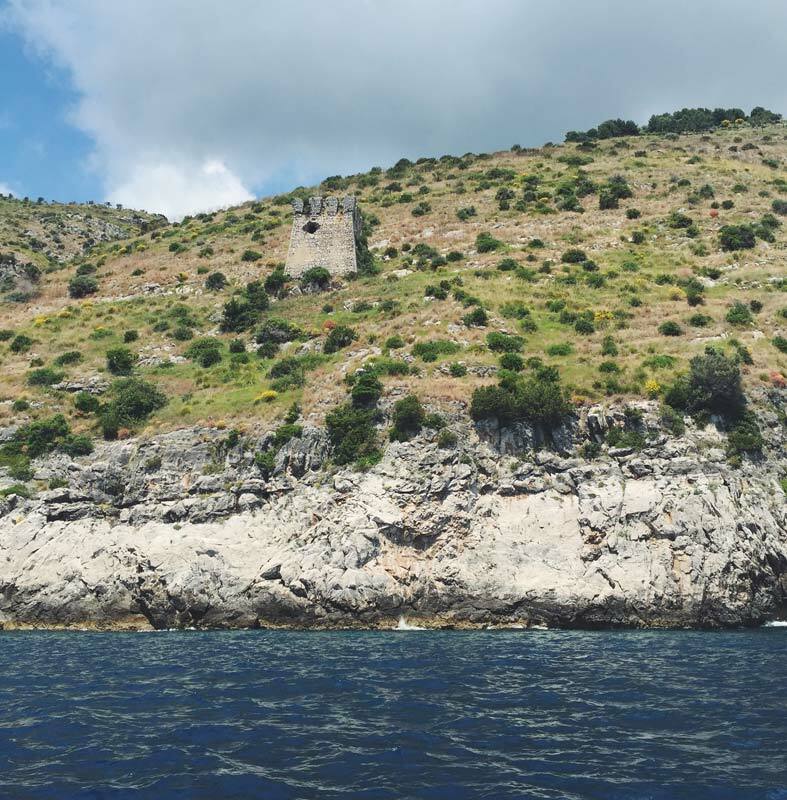 I was completely awestruck when we approached Li Galli Islands. Vincent started speaking in his parents' native Calabrian dialect and Salvatore was beaming, telling us the legend of the sirens who lived on the islands. He asked us if we'd like to go in for a swim, and I don't think I let him finish his sentence before I jumped off the boat. I could have floated around in that narrow straight between the small islands all day. Vincent and Salvatore joked they were going to just leave me there for the day. I don't think there are enough descriptive adjectives in the world to convey how truly beautiful that boat ride was. Sailing along the Amalfi Coast. As soon as we docked, we were whisked to a table where Antonia, Santina's daughter, made sure we had the most beautiful spread of seasonal foods. I started my meal with the beautiful pile of polpo and fish and couldn't stop saying, "My Dad would love this, my Dad would be so proud of me for eating all of this." Everything there was so pure, no-frills, delicious and true Italian food, the kind of food you imagine your ancestors diving right into after returning home from a long day at sea. I had zucchini pasta, and I'm fairly certain it changed my life. Of course, the next day I woke up feeling like a princess again. (It's kind of hard not to at Don Alfonso, with the king-sized bed softer than a cloud, the endless bright colors, the curtains of the terrace doors delicately blowing in the breeze.) We had coffee on the patio outside and watched honeybees landing on the garden roses before heading into our cooking class at Don Alfonso's beautiful on-site cooking school, which was also part of the prize. Sous chef Nicola made everything so much fun right from the start. Our classmate for the day was an Amalfi Coast local who lived in Sorrento. 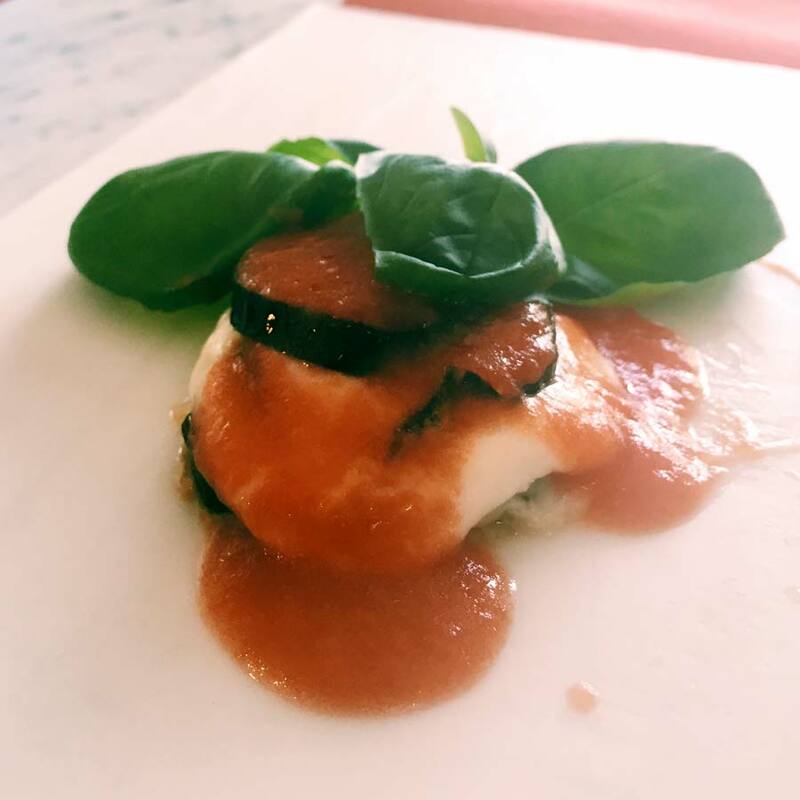 Together we cooked delicious dishes — potato galette, citrus lobster, and probably the most simple yet delicious eggplant parmigiana. But I think the most special part of the cooking class was the conversation we had about tomato sauce, its methods and traditions. I explained how many Italian-Americans still uphold the time-honored ritual: At the end of August, families come together, are assigned their respective jobs, and get to work making and jarring sauce from the tomatoes grown in their gardens all summer to use all winter. Our classmate couldn't believe it and seemed touched that Americans still hold these traditions in such high regard. But then, naturally, we were all distracted by our eggplant parmigiana. After our cooking class, Vinny and I raced down back to Lo Scoglio to hit the beach for a few hours. We gave a big hug to Antonia and met her father Peppino, the farmer responsible for the beautiful bounty they serve day in and day out. I think I could spend an entire summer on that beach. That's going to have to be a new goal of mine. Now on to Don Alfonso 1890. Dinner at Don Alfonso is almost like an out-of-body experience. The ingredients were so familiar yet SO elevated that they were in a league of their own in Italian cuisine. I had full intentions of documenting every course with a chic photo worthy of Food52's feed (they were another sponsor of the prize), but I got lost in the experience. Our waiter would bring over a plate, and it's like my brain forgot everything else in the world other than the piece of art being presented in front of me. At one point, probably around the seventh course, I seriously almost cried. Not because I was so full of food and wine, but because of how genuinely beautiful the food and the experience of dining here were. I am big on scent and memory triggers, and when I was drinking one of our sweeter wines (that happened to be from the area in Campania that my great-grandparents are from), I was completely overwhelmed and exclaimed, "I know this smell! I know this! This is Gigi's house!" And before I knew it, I was sitting at Don Alfonso nearly crying over a memory of playing with amaretti cookie wrappers and a little doll on the floor of my great-grandmother's house, a memory I hadn't recalled in ten years, maybe more. 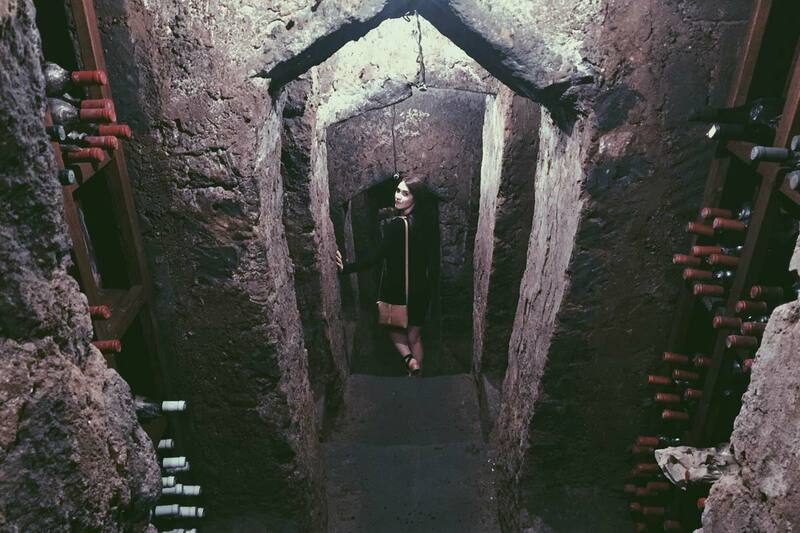 Emma in the wine cellar at Don Alfonso. Both Vinny and I were so wide-eyed and excited to venture down there after a detailed story about this passageway to the sea carved from the local stone tufo thousands of years ago. When we were led in, we raced down those Etruscan steps, past bottles of wine older than we were (combined), deeper and deeper down the pass, like a couple of seven-year-olds. Well, seven-year-old kids who had just dined at a Michelin-star restaurant and were wearing dress shoes and heels. When we hit the road the next morning for Rome, I was heartbroken. I have never been so sad to leave a place. 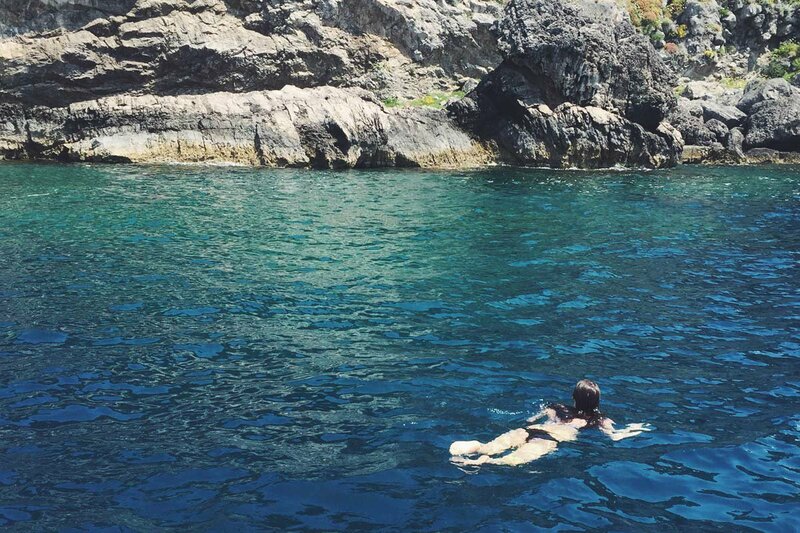 The Amalfi Coast has long been a favorite destination for travelers, and now I understand why. As an Italian-American, maybe even more so. Both Vinny and I left pieces of our heart and soul in this part of the world. And because of that, we have absolutely no choice but to come back. Emma is a perpetually nostalgic photographer. You can follow her at on Instagram. She travels for the photo ops and the food.